Clostridium tetani is a common soil bacterium and the causative agent of tetanus. When growing in soil, C. tetani are rod-shaped and up to 2.5 micrometres long. However, when forming spores C. tetani becomes substantially enlarged at one end, resembling tennis rackets or drumsticks. C. tetani spores are extremely hardy and can be found globally in soil or in the gastrointestinal tract of animals. If inoculated into a wound, C. tetani can grow and produce a potent toxin, tetanospasmin, which interferes with motor neurons, causing tetanus. All mammals are susceptible to the disease . The toxin's action can be prevented with tetanus toxoid vaccines, which are often administered to children worldwide. 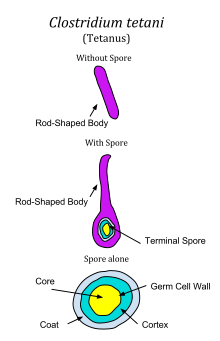 A diagram of C. tetani showing the bacterium alone, with a spore being produced, and the spore alone. C. tetani is a rod-shaped Gram-positive bacterium, typically up to 0.5 micrometers wide and 2.5 micrometers long. It is motile by way of various flagella that surround its body. C. tetani is an anaerobe and cannot survive in the presence of oxygen. It grows best at temperatures ranging from 33°C to 37°C. Upon exposure to various conditions, C. tetani can shed its flagella and form a spore. Each cell can form a single spore, generally at one end of the cell, giving the cell a distinctive drumstick shape. C. tetani spores are extremely hardy and are resistant to heat and various antiseptics. The spores are long-lived and are distributed worldwide in soils as well as in the intestines of various livestock and companion animals. C. tetani falls within the genus Clostridium, a broad group of over 150 species of Gram-positive bacteria. Within Clostridium, C. tetani falls within a cluster of nearly 100 species that are more closely related to each other than they are to any other genus. This cluster includes other pathogenic Clostridium species such as Clostridium botulinum and Clostridium perfringens. The closest relative to C. tetani is Clostridium cochlearium. Other Clostridium species can be divided into a number of genetically related groups, many of which are more closely related to members of other genera than they are to C. tetani. Examples of this include the human pathogen Clostridium difficile which is more closely related to members of genus Peptostreptococcus than to C. tetani. While C. tetani is frequently benign in the soil or in the intestinal tracts of animals, it can sometimes cause the severe disease tetanus. Disease generally begins with spores entering the body through a puncture wound. Once inside a wound, C. tetani spores germinate and grow, releasing the toxins tetanolysin and tetanospasmin as cells lyse. The function of tetanolysin is unclear, although it may help C. tetani to establish infection within a wound. Tetanospasmin (also called "tetanus toxin") is one of the most potent toxins known, with an estimated lethal dose of less than 2.5 nanograms per kilogram of body weight, and is responsible for the symptoms of tetanus. Tetanospasmin spreads via the lymphatic system and bloodstream throughout the body, where it is taken up into various parts of the nervous system. In the nervous system, tetanospasmin acts by blocking the release of the inhibitory neurotransmitters glycine and gamma-aminobutyric acid at motor nerve endings. This blockade leads to the widespread activation of motor neurons and spasming of muscles throughout the body. These muscle spasms generally begin at the top of the body and move down, beginning approximately 8 days after infection with lockjaw, followed by spasms of the abdominal muscles, and the limbs. Muscle spasms continue for several weeks. The gene encoding tetanospasmin is found on a plasmid carried by many strains of C. tetani; strains of bacteria lacking the plasmid are unable to produce toxin. The function of tetanospasmin in bacterial physiology is unknown. C. tetani is susceptible to a number of antibiotics including chloramphenicol, clindamycin, erythromycin, penicillin G, and tetracycline. However, the usefulness of treating C. tetani infections with antibiotics remains unclear. Instead, tetanus is often treated with tetanus immune globulin to bind up circulating tetanospasmin. Additionally, benzodiazepines or muscle relaxants may be given to reduce the effects of the muscle spasms. Damage from C. tetani infection is generally prevented by administration of a tetanus vaccine consisting of tetanospasmin inactivated by formaldehyde, called tetanus toxoid. This is made commercially by growing large quantities of C. tetani in fermenters, then purifying the toxin and inactivating in 40% formaldehyde for 4-6 weeks. The toxoid is generally coadministered with diphtheria toxoid and some form of pertussis vaccine as DPT vaccine or DTaP. This is given in several doses spaced out over months or years to elicit an immune response that protects the host from the effects of the toxin. C. tetani can be grown on various anaerobic growth media such as thioglycolate media, casein hydrolysate media, and blood agar. Cultures grow particularly well on media at a neutral to alkaline pH, supplemented with reducing agents. The genome of a C. tetani strain has been sequenced, containing 2.80 Mbp with 2,373 protein coding genes. Although clinical descriptions of tetanus can be found as far back as the 5th century B.C., the first clear connection to the soil was in 1884, when Arthur Nicolaier showed that animals injected with soil samples would develop tetanus. In 1889, C. tetani was isolated from a human victim by Kitasato Shibasaburō, who later showed that the organism could produce disease when injected into animals, and that the toxin could be neutralized by specific antibodies. In 1897, Edmond Nocard showed that tetanus antitoxin induced passive immunity in humans, and could be used for prophylaxis and treatment. The method of inactivating tetanus toxin with formaldehyde was developed by Gaston Ramon in the 1920s; this led to the development of the tetanus toxoid vaccine by P. Descombey in 1924, which was widely used to prevent tetanus induced by battle wounds during World War II. ^ Ryan, KJ; Ray, CG, eds. (2004). Sherris Medical Microbiology (4th ed.). McGraw Hill. ISBN 0-8385-8529-9. ^ a b c d e f g h i j k l m n o p q Roper MH, Wassilak SG, Tiwari TS, Orenstein WA (2013). "33 - Tetanus toxoid". Vaccines (6 ed.). Elsevier. pp. 746–772. doi:10.1016/B978-1-4557-0090-5.00039-2. ^ Madigan, M; Martinko, J, eds. (2005). Brock Biology of Microorganisms (11th ed.). Prentice Hall. ISBN 0-13-144329-1. ^ a b Centers for Disease Control and Prevention (2006). "Tetanus" (PDF). In Atkinson, W; Hamborsky, J; McIntyre, L; et al. (eds.). Epidemiology and Prevention of Vaccine-Preventable Diseases (The Pink Book) (10th ed.). Public Health Foundation. ^ a b c d e f g Rainey FA, Hollen BJ, Small AM (2015). "Clostridium". Bergey's Manual of Ststematics of Archaea and Bacteria. John Wiley & Sons. doi:10.1002/9781118960608.gbm00619. ^ Stackebrandt E, Rainey FA (1997). "Phylogenetic Relationships". In Rood JI, McClane BA, Songer JG, Titball RW (eds.). The Clostridia: Molecular Biology and Pathogenesis. ^ a b c d Todar, Ken (2005). "Pathogenic Clostridia, including Botulism and Tetanus". Todar's Online Textbook of Bacteriology. Retrieved 24 June 2018. ^ a b c d e f g h i j k Hamborsky J, Kroger A, Wolfe C, eds. (2015). "Tetanus". The Pink Book - Epidemiology and Prevention of Vaccine-Preventable Diseases (13 ed.). U.S. Centers for Disease Control and Prevention. Retrieved 24 June 2018. ^ Bruggemann, H.; Baumer, S.; Fricke, WF. ; Wiezer, A.; Liesegang, H.; Decker, I.; Herzberg, C.; Martinez-Arias, R.; et al. (Feb 2003). "The genome sequence of Clostridium tetani, the causative agent of tetanus disease" (PDF). Proc Natl Acad Sci U S A. 100 (3): 1316–21. doi:10.1073/pnas.0335853100. PMC 298770. PMID 12552129. Clinical Microbiology Made Ridiculously Simple, Edition 3. ISBN 0-940780-49-6. Centers for Disease Control and Prevention (2012). "Ch. 20: Tetanus". In Atkinson, W; Wolfe, S; Hamborsky, J (eds.). Epidemiology and Prevention of Vaccine-Preventable Diseases (12th ed.). Washington DC: Public Health Foundation. pp. 291–300.